Red Mill students give a presentation about digital citizenship. As technology continues to evolve and enter kids’ lives both in school and at home, digital citizenship and safety are important topics to discuss. 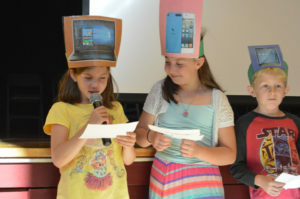 Red Mill students learned more about this on Thursday at a school-wide assembly that featured skits performed by classmates and teachers, as well as an informational video. Students also gave a presentation to the Board of Education on Wednesday evening with Mrs. Fontaine, Mrs. Duncan and Mrs. Mahar.